A new class of progressive leaders from all over the country just stepped into seats in Congress — ensuring the House of Representatives could counterbalance the conservative monopoly on federal power. With them came the hopes and expectations of a nation of immigrants, women, people of color, disabled people and people with medical conditions, and everyone who’s ready to fight for a safe climate and just future for all of us. Now, as our newly elected leaders take office, it’s time for action. The science is clear: we need climate solutions now, and we don’t have a moment to lose. We’re calling on our new Congress to align their policies with science and their priorities with the moral imperative of this moment. We’re calling for real climate leadership. Stand up to the fossil fuel industry: end government handouts to polluting coal, oil, and gas corporations, and investigate Exxon and other big polluters for misleading the public and wrecking the climate. Support visionary legislation like a Green New Deal to create millions of good green jobs and hasten a just and equitable transition to 100% renewable energy for all. Stop all new coal, oil and gas projects. Sign the letter today to demand the real climate leadership we need. The United Nations Intergovernmental Panel on Climate Change (IPCC) has sounded the alarm. We have a decade to prevent catastrophic warming of more than 1.5 degrees Celsius (2.7 degrees Fahrenheit), the target set by world leaders in the Paris Agreement. That means we must phase out fossil fuels and scale up clean, renewable energy as fast as possible—and it will be crucial that the next Congress take action and show real climate leadership to make that transition happen. The costs of inaction are already devastating. In recent years, unprecedented climate-change-fueled hurricanes, floods and fires have taken lives and livelihoods, leveled homes and cities costing taxpayers over $350 billion in economic damages from Puerto Rico to California and Houston to New York City, according to the Government Accountability Office, a nonpartisan federal watchdog. We know who is responsible: President Trump’s billionaire friends in the fossil fuel industry. Fossil fuel corporations are far and away the largest contributors to anthropogenic climate change. Through concerted disinformation campaigns designed to confuse the public, buy off politicians and stymie climate action, Big Coal, Oil, and Gas executives have rigged our democracy to pad their pockets at the expense of the public and the planet we share. But they cannot hold back the truth forever, and the benefits of bold climate action are becoming clearer by the day. A just and equitable energy transition has the potential to put millions of Americans to work in good green jobs, bring our neglected infrastructure into the 21st century and position the United States as a global leader in clean energy technologies. If we act now, we can rein in emissions, create opportunity for communities damaged by the fossil fuel industry and climate disasters and build a healthy and prosperous nation. The world as we know it depends on you. We are writing to you as everyday people—workers, scientists, faith leaders, mothers, fathers, activists, businesspeople, children, men, women, the LGBTQ community, immigrants, Indigenous peoples and much more. We have marched in the streets of New York, Washington D.C. and San Francisco. We have stopped the Keystone XL pipeline—twice—and will stop it again if TransCanada tries to build it. And we have advocated for common-sense climate solutions at all levels of government, from city halls to the White House. As elected officials, you are accountable to us. In this fight—a fight that will define human civilization—we have done our part. And now it’s time for you to do yours: align your policies with science, and your priorities with the moral imperative of this moment. Be a real climate leader. Cut ties with the fossil fuel corporations rigging our democracy. Sign the No Fossil Fuel Money Pledge taken by more than 1,200 candidates and elected officials, and refuse all donations from fossil fuel corporations. End all government handouts that benefit polluting coal, oil and gas corporations. Divest all public funds from fossil fuel corporations that imperil our planet and our economy. Serious climate policy must prioritize the frontline communities and workers left behind and endangered by the fossil fuel industry. The UN IPCC report, informed by thousands of leading scientific studies, shows that fossil fuel expansion is fundamentally incompatible with a livable climate. Use your power as a legislator to stop Trump’s big polluter agenda. Hold big polluters responsible for misleading the public and wrecking the climate. Launch a congressional investigation into ExxonMobil and other fossil fuel corporations for propagating confusion and denial about the scientific truth of climate change and for hiding the risks posed by their business activities to the planet. The above actions are the true litmus test of elected officials who take climate change seriously. But climate change is also a cross-cutting issue that impacts everything from public health to immigration, financial regulation to economic inequality, education to national security and transportation to housing. We expect you to stand with us, the people, and immediately address the causes and the symptoms of the climate crisis. Real climate leaders must fight the Trump agenda every step of the way and take action to prepare all levels of government and society for this crisis. We are ready. We are resilient. We are real climate leaders. Are you? Thank you so much for calling on our new Congress to step up and be the real climate leaders we need. Now that you've spoken up, we have a big request: the week of February 4-8, we'll be delivering your signatures in person to Congressional Representatives around the country — and we need you to take action in your district. Finally, can you also share this letter with your friends and family using the tools below? Now, as our newly elected leaders take office, it’s time for action. 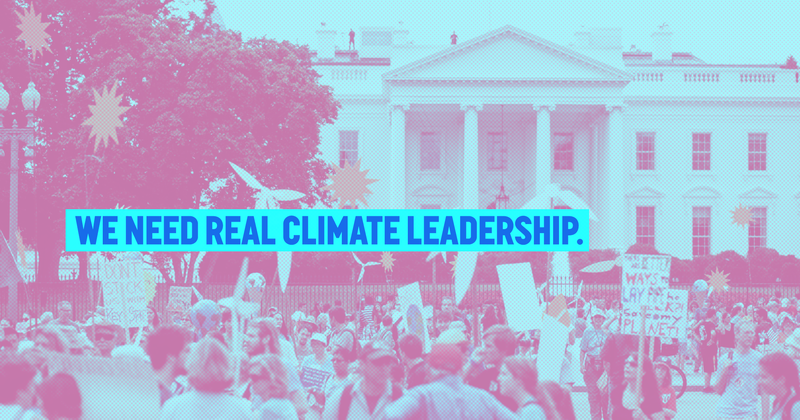 Call on our new Congress to step up and be the real climate leaders we need.